Today marks a milestone in the OnePageCRM development roadmap. After months of careful consideration, coding and bug-fixing we launch our new and improved UX and Account View. With the new Account View you can focus on the company first, with a separate description and company-wide custom fields. In typical OnePageCRM fashion, we’ve further simplified the sale process by bringing your prospecting tools into the CRM. Conduct further research on companies by searching via Duedil, LinkedIn, Hoover, Google and Facebook. Finally, with the addition of our ‘Linked Contacts’ you can now link external contacts to a company in the CRM; ideal when you have multiple parties involved in the decision making process for a deal. New Research menu: Perform deep research on key contacts using Hoover, DueDil, LinkedIn, Facebook or Twitter. Company description field: Specific information on the company, not just the individual contacts. Company-wide custom fields: Now custom fields can be applied to companies. Linking contacts: Link contacts to the account view that are related to the sale but not part of the prospect company. Contact / Company switcher: Switch quickly between Account view and your individual contacts within the company. Enhanced A-Z Contact list: See all contacts within an company at a glance. Bulk updates: Apply bulk updates to companies, not just contacts. Status Sync: The Status of contacts within an account are not in sync by default, you can enable this feature if you wish. 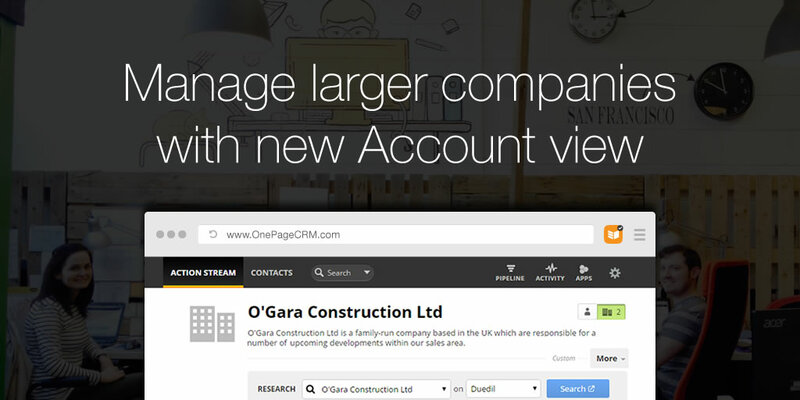 At OnePageCRM, we are constantly looking to improve our system in line with our customers growing business needs. The launch of the new Account View marks the first of many great updates due for roll out this year. To learn more and contribute to our Development Roadmap click here. Enhance your contact's profile information with just-one-click! 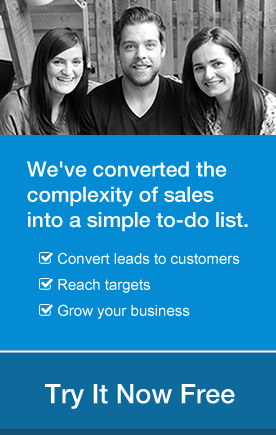 I really like your company view with custom fields – it will making B2B sales so much easier. I had previously stored 4 or 5 pieces of info in people custom fields which can now be moved to the company level. Is there any way you can provide a routine to update company fields from the people fields ? Thanks for your feedback, it’s great to hear! As stands right now we do not have that functionality but we are collecting feedback for future development of the Account view (I’ve added yours to the list). Will keep you posted if this is something that’s taken on board. Agree with Mike. A way to migrate all that info over would be helpful. I have tons of info I need to move over. Thanks for leaving a comment. This is one we’ll be hopefully looking into in the near future (definitely a great feature). I’ve taken note to contact you once we get an update on it. I don’t seem to be able to do this in the 2 column layout – is it possible to as I prefer that layout? Hi Charlie, I’m afraid the company wide updates are only available in our default 1-column layout. I’ll be sure to make a note of your suggestion for future updates! Keep the feedback coming! ^Carmel ?